The poster for UFC Fight Night: Iaquinta vs. Cowboy. UFC Fight Night: Iaquinta vs. 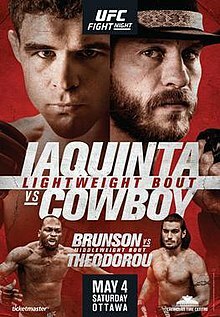 Cowboy (also known as UFC on ESPN+ 8 or UFC Fight Night 150) is an upcoming mixed martial arts event produced by the Ultimate Fighting Championship that will be held on May 4, 2019 at the Canadian Tire Centre in Ottawa, Ontario, Canada. The event will be the promotion's second visit to Ottawa, following UFC Fight Night: MacDonald vs. Thompson which took place in June of 2016 at TD Place Arena. A lightweight bout between Al Iaquinta and former UFC Lightweight Championship challenger Donald Cerrone has been slated to serve as the event headliner. A heavyweight bout between Walt Harris and Alexey Oleynik was originally scheduled to take place at this event. However on April 3, it was announced that Oleinik would be replacing former Bellator Heavyweight Champion Alexander Volkov against the 2010 K-1 World Grand Prix Champion and former Strikeforce Heavyweight Champion Alistair Overeem in the main event of UFC on ESPN+ 7. He was replaced by Sergey Spivak. Leah Letson was expected to face Sarah Moras at the event. However, Letson was removed from the fight in early April for an unspecified medical issue and was replaced by Macy Chiasson. Brian Kelleher was expected to face Mitch Gagnon at the event. However Kelleher pulled out of the fight on April 10 citing injury and was replaced by promotional newcomer Cole Smith. ^ a b Jesse Holland (February 20, 2019). "UFC Ottawa official for May 4 on ESPN+". mmamania.com. ^ a b Press Release (2019-03-20). "Iaquinta vs Cowboy for Ottawa main event". espn.com. Retrieved 2019-03-20. ^ Brett Okamoto (2019-03-19). "Sources: Iaquinta, Cerrone agree to May 4 fight". espn.com. Retrieved 2019-03-19. ^ Alexander K. Lee (2019-04-09). "Unbeaten Sergey Spivak steps in to fight Walt Harris at UFC Ottawa". mmafighting.com. Retrieved 2019-04-10. ^ a b Staff (2019-04-03). "Canadian bantamweight Sarah Moras gets new opponent for UFC Ottawa card". chroniclejournal.com. Retrieved 2019-04-03. ^ "UFC Fight Night: Iaquinta vs. Cowboy". www.ufc.com. Retrieved 2019-03-08.